This page shows construction maps and displays for each segment of the two US 45 projects. For construction scope, schedule and traffic maps, please see our US 45 project overview webpage. 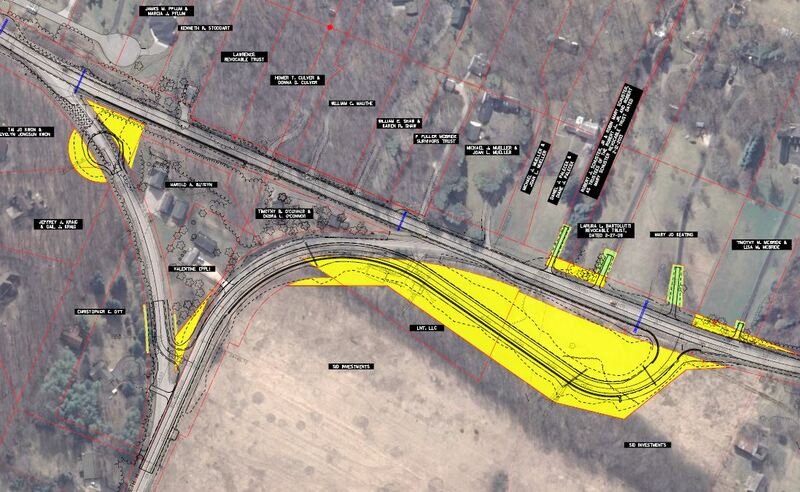 The below construction detail displays show existing and future right-of-way, temporary limited easements, and slope intercepts for the resurfacing portion of the project. Each of the five maps represent a portion of the US 45 resurfacing, beginning at the southern limits of the project (Map 1) and north to the village of Eden (Map 5). The below construction detail maps show roadway design, sidewalk, curb & gutter, driveway, existing and future right of way, temporary limited easements and tree removal within village limits. Currently, County H splits and forms two intersections with US 45. Both of the intersections have substandard geometrics (do not form a 90 degree intersection). The existing County H intersection will be relocated and reconstructed to meet safety and design standards.